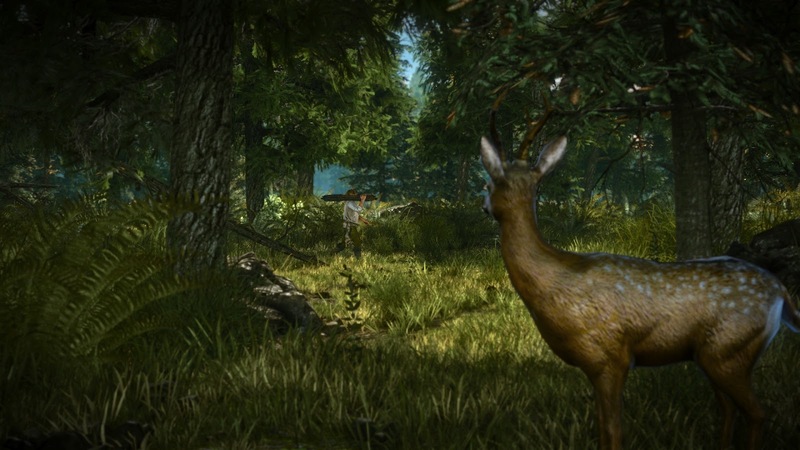 The Witcher is already a well established RPG franchise in the world of PC gaming. Last year marked the debut of its critically acclaimed sequel which is currently in the process of receiving a colossal 10 GB DLC enhancement for free adding a plethora of new content. Coinciding with the new update, Xbox 360 users will finally get a chance to see what all the fuss is about with their very own port of this enhanced fantasy epic. The story follows the exploits of Geralt, a specialist monster hunter known as a Witcher whose mutated body provides him with an array of supernatural abilities. The game starts shortly after the conclusion of the original title as Geralt is imprisoned for a crime that he didn’t commit. Geralt however is able to convince his captors of his innocence and is secretly freed with the task of finding the real perpetrator who coincidently also happens to be a Witcher. Now a fugitive on the run, Geralt must pursue the man responsible while the neighbouring kingdoms around him use our hero as a pawn to engage in a political power struggle both physical and clandestine. The Witcher 2 provides a grim yet intriguing fantasy setting that is far removed from the same Tolkien-esque copy and paste jobs that commonly plague its contemporaries. Even the world’s view on morality is very distant from the standard conventions of good versus evil as nearly every character in The Witcher 2 falls into some shade of grey. This hazy moral compass is well reflected in the choice of dialogue options provided throughout the course of the story as no answer ever truly feels like the good or bad choice. This sense of uncertainty provides a remarkable amount of tension as every action taken throughout the course of the game is met with an equal and opposite reaction. Interestingly some of these choices can create immediate results while others may come back to haunt the player at a later date. In addition, some of these choices go far beyond minor repercussions and can literally change entire sections of the game warranting a huge amount of replay value. Being a novel adaption certainly favours The Witcher 2 as the vast array of characters both major and minor each bring something unique and are brimming with a level of personality not usually seen in other video games. Though pre-existing benefits aside the game’s greatest quality is evident in the sheer strength of its writing. Character dialogue is on par with some of the best in TV and film today and it will inevitably heighten your expectations of the quality of future writing in the Action RPG genre. Though for many who start without dabbling in the previous title, The Witcher 2 will feel a little overwhelming at first. There is a lot to catch up on and for the first few hours of the game you will feel as if you have walked in half way through a plot heavy movie or attempted to start reading a long fantasy novel from chapter twenty. There are a few videos to watch in the extras menu to help bring the player up to speed but they do not do nearly enough to provide some foreshadowing on the game’s setting. Much like the plot, playing The Witcher 2 starts out as an incredibly confusing ordeal. While the game system is certainly robust the standard mechanics of exploring the environment, combat, item management, item enhancement, magic, alchemy, potion drinking, level progression tree and everything else comes at you all at once and it is far too overwhelming to comprehend at first. Though despite some early stages of bewilderment after an hour or two players will start to feel more confident with the control scheme which has been sensibly altered to accommodate for the Xbox controller. Once mastered, controlling Geralt comes with relative ease and offers very little hindrance to the player, though one small exception is noted when attempting to pick up items in the environment which can more than often feel too fiddly even at the best of times. Anyone betting on Geralt to win here? The game does make early attempts to remedy the initial sense of information overload by offering a very dull tutorial session which unproductively helps in creating more confusion then it actually prevents. The initial speed bump will inevitably affect your performance throughout the tutorial which is also used as a measure to recommend the difficulty of the gameplay. After completing the tutorial for the first time the game will assume that your level of competency is faux par and will suggest that you play the game in easy mode adding salt to the wound. But the suggestion of offering an easier than expected difficulty after a shaky start is purely a suggestion of caution rather than a taunt as The Witcher 2 is a surprisingly hard game. Non-PC gamer’s best be prepared as the level of challenge and difficulty that the game offers is not something that mainstream console gaming has seen for many years. The Witcher 2 is a true test of nerve and patience, even when exploring an environment as part of a sub-quest, vigilance is advised at all times in order to avoid the tedium of death and backtracking. Though this description sounds like a negative point the difficulty is not without justification. 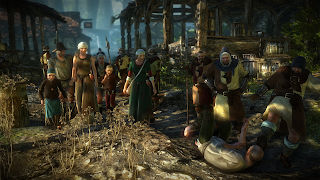 The Witcher 2 (for the most part) is a strong ambassador for the philosophy of “harsh but fair”. Combat especially is always a challenge that will forever keep a player on their toes and forgetting this can quickly leave them dead. This attitude is spread across nearly every facet of gameplay in The Witcher 2. Running carelessly into the unknown will get you killed. Failing to take the time to study monsters in the wild will get you killed. Refusal to take the time to make appropriate traps and oils will get you killed. Being too impatient to counter attack an enemy and just blindly swinging your sword will get you killed. Get the point? The majority of the time a result of failure will usually be the responsibility of the player alone as The Witcher 2 cleverly decides to oversee events with a sense of fair play rather than hold their hand the entire way. The world is full of characters and different personalities. Sadly despite current praises so far not every moment is perfect. Console players will sadly have to learn the time honoured PC gaming tradition of quick saving. This tedious yet very necessary method involves having to stop and save the game every few minutes. Saving often is a highly recommended practice in The Witcher 2 as the auto saves while present simply do not cover the right steps in the flow of gameplay. The game rarely auto saves and so the simple acts of casually walking out into the open or spending half an hour on a sub quest can easily end in tears because time wasn’t taken to do something that the game should already be doing on your behalf. Also it is worth noting that while the majority of the gameplay works well there are occasionally some lesser used mechanics that are simply not up to scratch with the rest of the game. The most prominent example of this is the rare use of stealth mechanics that are abominable and truly feel like they were put in at the very last minute. When compared to the original release a year ago. 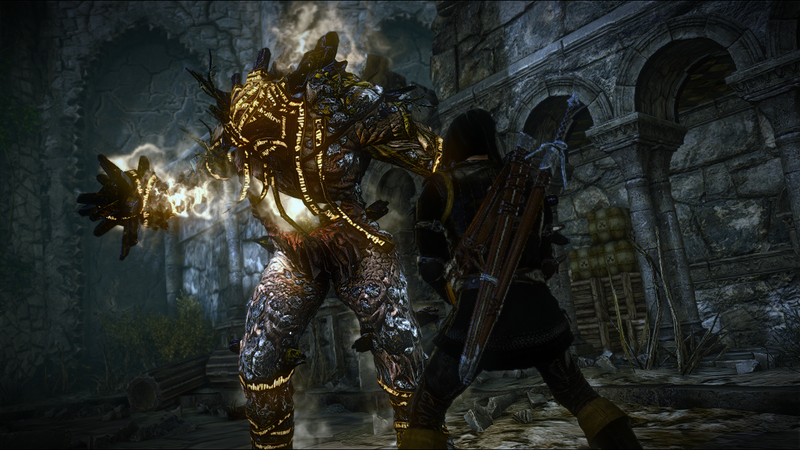 The Witcher 2 Enhanced Edition has come forward in leaps and bounds in the graphical department. Many of the character models have been updated or remapped and now look better than ever, environments are filled with an expanded variety of flora and fauna and graphical tweaks are noticeable right across the board from better dynamic lighting and shading to a greater depth of colour palette and texturing. In addition to these graphical improvements The Witcher 2 Enhanced Edition also sports some new cut scenes including a three and a half minute pre-rendered cinematic opening by BAFTA award winner Tomasz Baginski. This sequence depicts an important event that predates the beginning of the story and it is simply breath taking in every sense of the word, setting the overall tone for the rest of the game. The only disappointment that you’ll draw from it is that you won’t see another one as the rest of the cinematics’ are done either as in-game cut scenes or by using bold and striking 2D animations. While they are certainly impressive the mash up of styles weakens the games overall artistic consistency, this is no more so apparent than in the new chapter bridging cut scenes featuring the most out of place voiceover to ever be used in The Witcher. Giving the impression that someone just happened to stumble into the wrong recording studio that day. 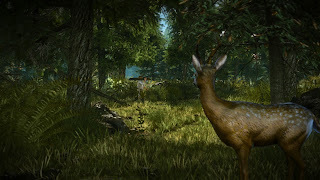 Though despite every effort to improve The Witcher 2 on a graphical front, this port is somewhat of a double edge sword. 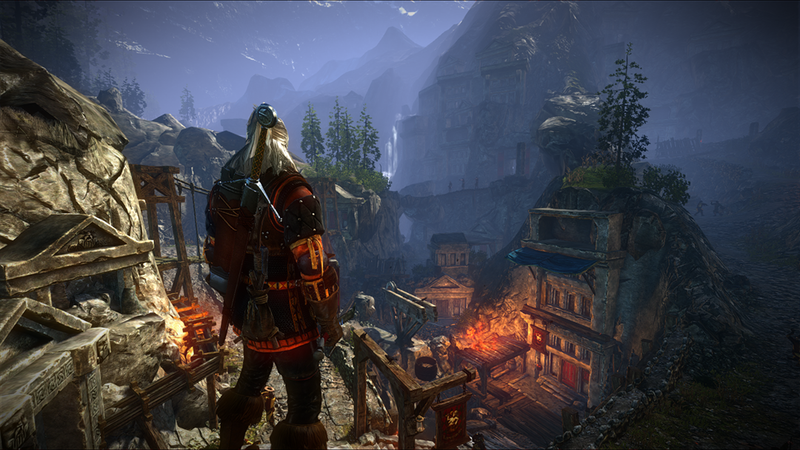 Like many PC to console ports, the graphical capabilities of the Xbox have not been kind to The Witcher 2. Though the inevitable outcome of toned down graphics comes with little surprise, what does amaze is the fact that there are some severe graphical issues present. More than often major textures both character and environmental will violently pop and load in, sadly this side effect is not subtle and mostly occurs during conversations with NPC’s or during in-game cut scenes. This flaw creates an unnecessary distraction which heavily draws the player’s attention away from the impact of the epic story. The game is also plagued with occasional v-sync issues and screen tearing which is impossible to ignore. At the start you are recommended to install the game in order to boost the graphical capabilities though disappointingly this suggestion provides very little remedy to the issue. The Witcher 2 is a fantastic game. The length and the quality of its content easily justifies the price, though peppered with a few niggling flaws, The Witcher 2 is a true example of the direction that other titles in the Action RPG genre should be striving towards. While it is more than obvious (and mostly expected) that the Xbox version is the least superior port it goes without saying that The Witcher 2 Enchanced Edition is an unforgettable experience. If forking out the money for a gaming PC is out of the question then you certainly cannot go wrong with this almost faithful console counterpart.